Higgins Armory Museum is the only museum in the Western Hemisphere solely dedicated to arms and armor. The following are links about Higgins Armory you may find interesting. Also check out the other pages. The official website of the museum. The following are comments left about Higgins Armory from site visitors such as yourself. They are not spell checked or reviewed for accuracy. I have many fond memories of the Higgins Armory when I used to visit (from Fitchburg) in the mid 1950s. It was always an interesting place, no matter how often I went or how old I got. Hope it's still open to the public - one of those one-of-a-kind quirky museums that semed to strike the right chord (I never cared much for museums, but this was an exception). The building had wonderful natural light and the architecture sucessfully blended Gothic and Art Deco - that alone is a terrific achievement. Thanks for letting me reminisce. I went to Burncoat High and sometimes on the way home we would stop and visit the Higgins Armory. Wonderful tribute to the days of yore as is this picture. 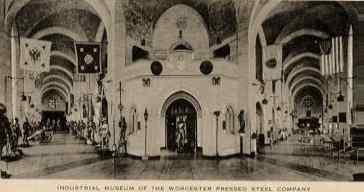 I remember visiting the Worcester Pressed Steel Musuem about 62 years ago. I was so impressed with the old bibles and armor. I would like to have my grandchildren visit this place to see if they would be as impressed as I was. I always wanted to go to this museum. My teens are so wrapped up in medevil lore, ect. We'll have to check it out when we visit Worcester again. I worked at Worcester Pressed Steel (Higgons Armory) 1972, they make Revere ware and at one time roller skate keys, they were across from the Odd Fellows Home. I remember going to the Higgins Armory on a school trip and (of all things) the picture that stayed in my mind was that of the dog in armor. When I had a son of my own, my husband and I took him there. He was a little guy but was so fascinated, especially with the swords. My husband ended up buying one and it sits on our fireplace hearth in Highland Village, TX. Loved this place - it was like taking a step back in time where you could dream about living a different kind of life. Of course that image was shattered when my son opened a door that said "Do Not Open" and all the alarms went off! Another good reason to learn to read - ha ha. A fantastic museum, probably the best in USA for Cresades Armor (circa 1400's ?). Yup I remember the school trips(1950's) and seeing the armor for a dog. If you in Worcester the modest cost is worth the visit. Ryan, my junior in college now, was only 8 and I took him to one of the places I grew up at (I'm from Worcester). He has not forgotten it. In January 2014, the Higgins Armory Museum will transfer to the Worcester Art Museum its unique collection of arms and armor, which is widely regarded as one of the three most significant arms and armor collections in the Americas. The transfer, which will allow the collection to remain on display in Worcester, will follow the closure of Higgins at the end of 2013. Closeing on December 31, 2013 at 100 Barber Ave. in Worcester. How I cried when I heard of Higgins Armory closing. It was my favorite place to go during the summer. One year I had to go in a wheelchair due to foot surgery for my Cerebral Palsy, but I still had fun. It's too bad all those wonderful places of our childhood are gone.